We’re proud to be a prime contractor for all five branches of the US Armed Forces. As leaders in the production of lifesaving military parachutes, we approach this responsibility with the seriousness it deserves. 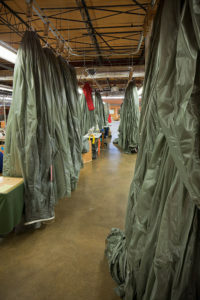 With one location on the east coast, Mills Manufacturing is well situated to produce and efficiently ship airborne troop parachutes, cargo parachutes, extraction parachutes, deceleration parachutes, and other ancillary items. What we deliver relies on more than just our words to be the safest, longest lasting, and high quality product. Everything that leaves our doors has passed multiple inspections and testing, and we maintain a current ISO 9001 registration. The US military is a demanding client, and for good reason: Our soldiers’ lives depend on our quality. We strive to ensure that every part of our manufacturing process is the best it can be. Each textile item made for the US Department of Defense is in strict compliance with the Berry Amendment, which requires 100% of raw materials to be sourced from the United States. In addition to complying with the high standards set by the Pentagon and the ISO, we also serve on government specification committees and work with other members of the industry to develop and revise better quality standards. As a trusted supplier to the men and women who risk their lives to protect others, we have extended our services to include commercial and industrial cut and sew manufacturing. For these items, clients can expect the same military-grade, and resilient quality that brings our troops safely to the ground every time. Whether you’re in the market for a long- or short-term contract, we’re looking forward to working with you!